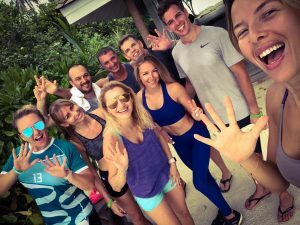 The event involved daily morning and afternoon training sessions in the resort’s Yoga Pavilion, healthy meal plans curated by Marta Kielak, Ewa’s official dietitian; private dietary consultations before and after the event, fun-packed excursions and customised body readings using the Body Composition Analyzer ‘Tanita’. 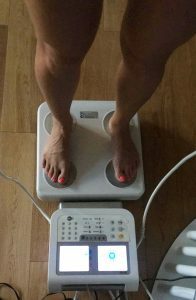 The machine gives clinically accurate readings, which are helpful for understanding the impact of diet and exercise on your body. Guests also could join the group fitness activities at Kandima’s state-of-the art BURN Fitness Centre with its own private swimming pool (15m/ 50 feet), fitness pavilion offering Aqua Fun & Fit, Pilates, Kross Fit, TRX Suspension Training, POUND® fit, boxing and both traditional yoga and aerial yoga classes. The island is also home to the longest swimming pool in the Maldives – Breeze Pool, and also boasts a stunning 3-kilometer long beach that is perfect for those morning runs and sunset walking tours. The one-week package includes accommodation for seven nights in a Sky or Beach Studio, personalized heathy meal plan (Full Board) based on Ewa’s signature Be Diet plan, one guided snorkeling excursion, snorkeling gear rental for the whole stay, daily welcome mocktails at Breeze Pool Bar, POUND® class and a welcome gift upon arrival. Ewa’s fitness empire began with training videos, which have motivated women to exercise regularly and with long-term results. Now she sells over twenty signature training DVDs, ten book titles, out which many have become international bestsellers; sport equipment and her unique dieting plan that goes hand in hand with her signature training programs such as Scalpel, Turbo Fat Burning or Killer. She is also known as the editor in chief of Be Active magazine and runs inspiring fitness workshops all over the world. She has over 2 million fans on Facebook and over 1.4 million on Instagram. In 2014 Ewa set the Guinness World Record for hosting the world’s largest group exercise. In 2017 Ewa set the Guinness World Record for the largest group holding one minute in abdominal plank position.